No, no we haven't decided to remodel our kitchen - yet. Today our daughter Ella turns 2! I seriously can't even believe two years have gone this quickly. I've been a bit of a mess about the whole thing. 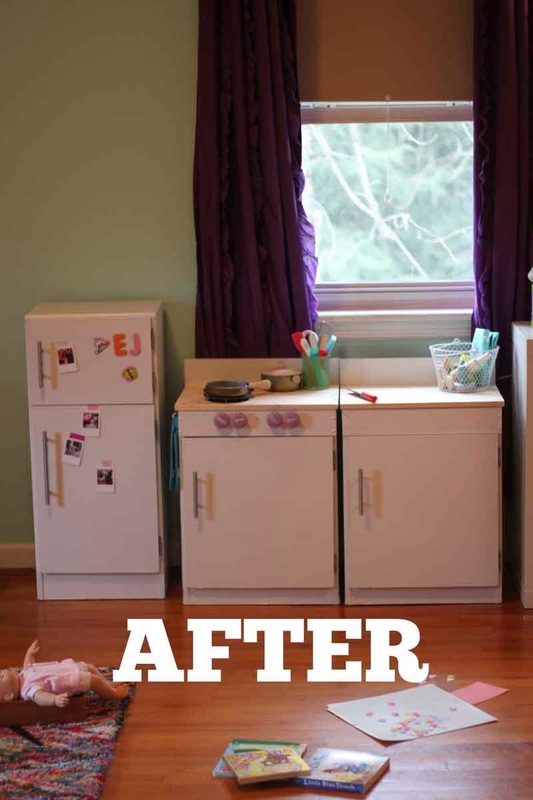 I'm planning on sharing some of the details from her birthday party next week - like I did last year - but a few folks asked for details on her play kitchen after I shared a photo of her "before" kitchen. I prefer to make her a birthday gift instead of buying one since her birthday is just off the heels of Christmas. Also I'm just the kind of sentimental nut who can't leave well enough alone. I was insistent that "we" build her a play kitchen, by "we" I mean my husband. Said husband was also insistent that we did not have time, that a store-bought kitchen would suffice, and that he was not making a damn thing from scratch. I tried shopping and even settled on a play kitchen to order online. This guide was incredible helpful, but the week I should have ordered it I just could not push "pay". 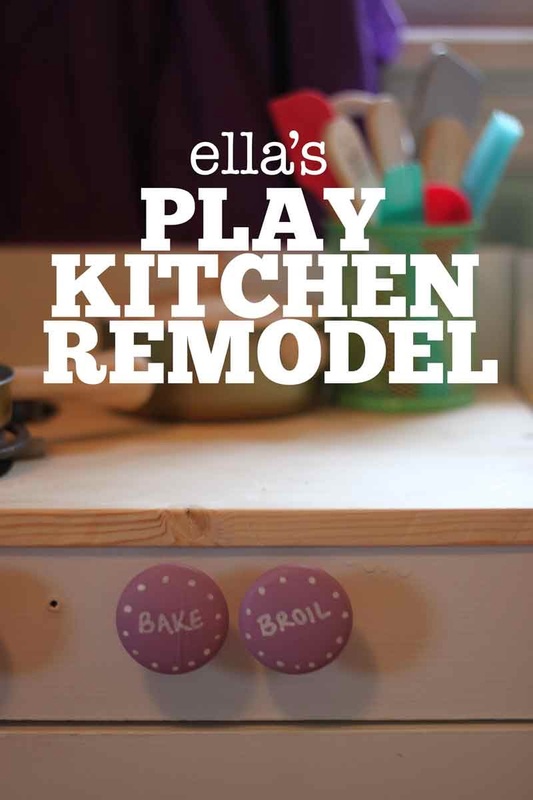 I wanted Ella's play kitchen to be as special as she is to me. Also I think these birthday projects give me something to obsess over so that I don't have to accept that my little baby keeps growing up despite my pleas for her to stay a baby forever. I did what any other blogger would do and posted my query on the webernet - was it better to buy a play kitchen of DIY one? A facebook friend suggested that we look on craigslist for a used play kitchen. And that's where I found this vintage gem. Originally the seller was asking $100 but the vintage play kitchen had been listed for several weeks and wasn't in the best shape. Much to my delight the seller accepted my low-ball offer of just $40! 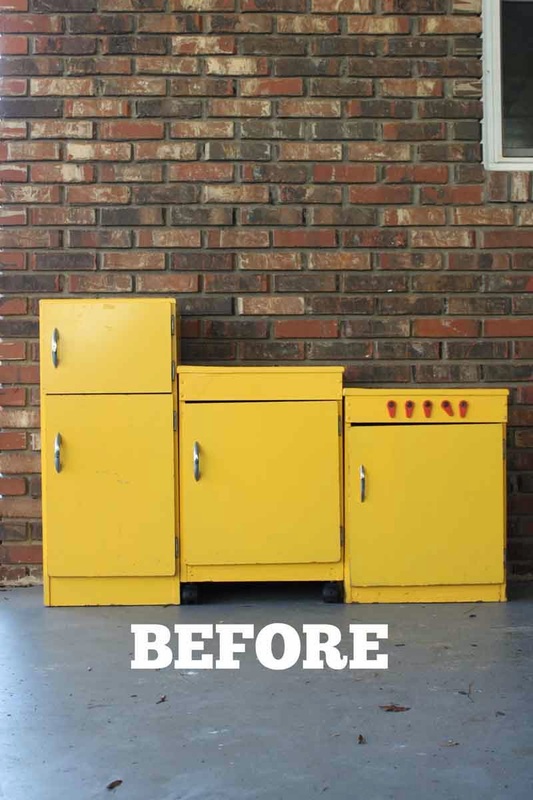 This vintage play kitchen was the best compromise for the husband and I; We got a sturdy wooden play kitchen that he didn't have to build but that need just enough work to make it feel like a from scratch DIY. The cabinets tops were warped and scratched - so they were the first thing to go. We made a trip to Home Depot for some paint (a quart of white and a quart of magnet paint) some knobs, handles, a set of push lights, and a 24 inch by 36 inch board of oak. We'd hoped to find a bathroom faucet to use for a sink, but the ones we liked were expensive and the cheap ones were kind of bulky. 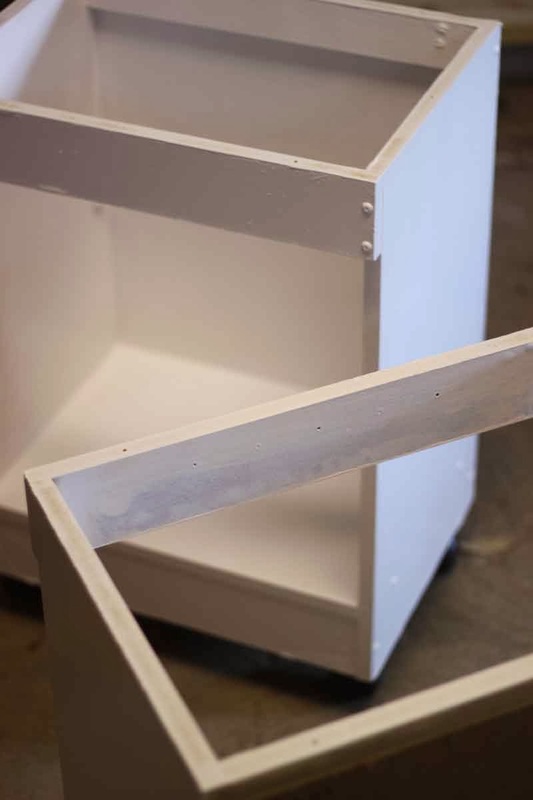 My husband removed the doors on all three pieces (the fridge, oven, and cabinet) and painted the oven and cabinet with three coats of white paint and primer in one (I believe it was RustOleum. He used the old tops as templates to cut the two new counter tops and then used the leftover wood to make a short back splash, which he also painted white. 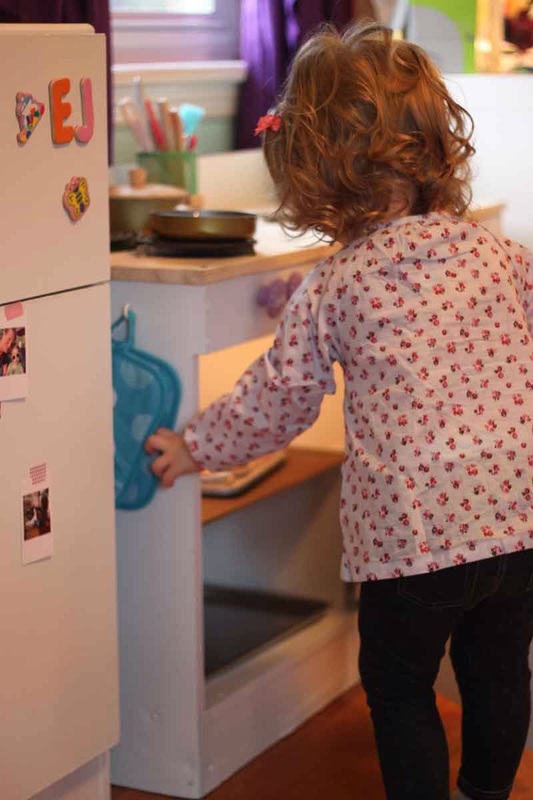 The magnet paint was the biggest splurge of the project - at $19 a can - but I really wanted Ella to be able to use her magnets on her fridge. 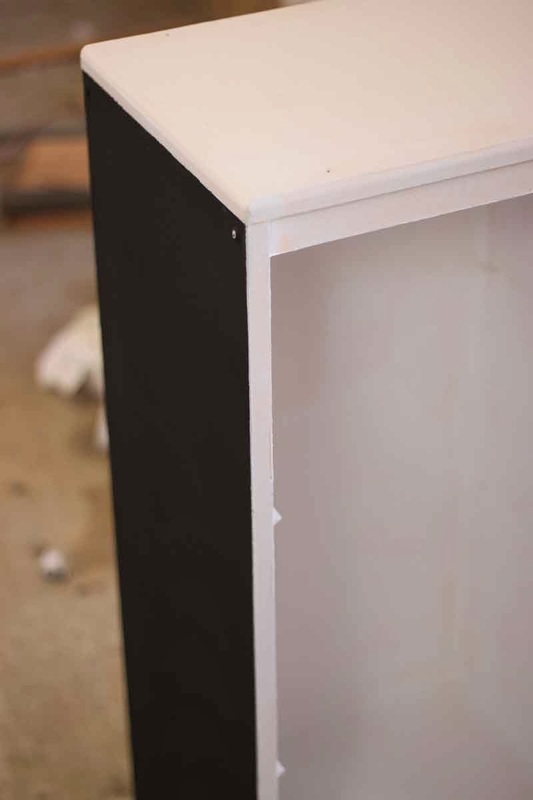 We painted three coats on the sides and door fronts of the fridge. I would have done another few coats, but we were literally painting the magnet paint on the night before her birthday party and we still needed to do two coats of white paint over the magnet paint. Small magnets stick just fine to the finished fridge, but larger magnets don't hold at all. I had originally painted two burners on the new counter top with the magnet paint as well (I traced a roll of masking tape with a pencil and filled in the circle with a small paint brush) but my mom discovered some old electric cal-rods in one of the closets in our shop (we're still moving in and discovering things in our new home) So my husband attached two of them as well. We attached new handles to all three cabinets. I painted some unfinished wooden knobs with two coats of kraft paint and labelled them with a paint pen to act as playful oven knobs. 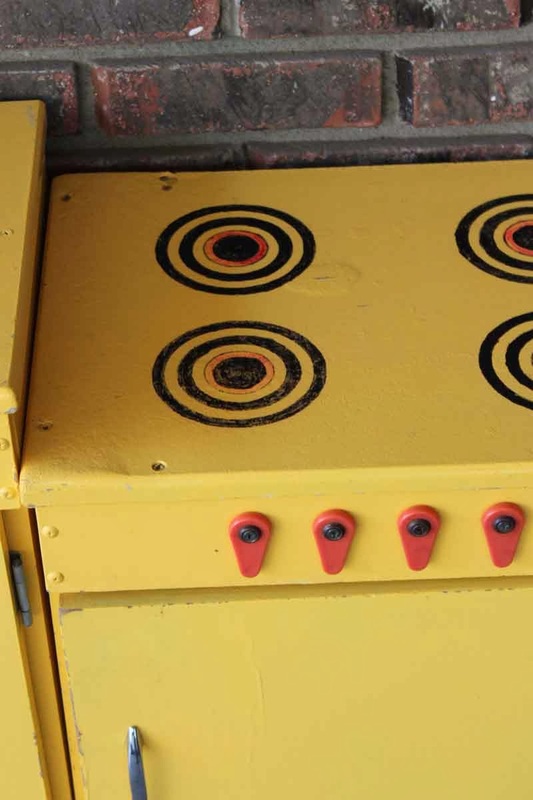 We also added a push light inside the oven. We have plans to add another light to the fridge, but since the play fridge's paint was still drying when we moved it from our workshop into the house the morning of Ella's birthday party (we wanted her to "open" it on her birthday party day so she could play with it with her friends)we had to wait and still haven't gotten to it. I ordered a set of Plan Toys Pots and Pans and a Plan Toys Baking set, but everything else came from either our house, the dollar spot at Target or the dollar store. Also her aunt gave her a Melissa and Doug cookie set as a birthday gift. My husband added a small hook for Ella's pot holders. 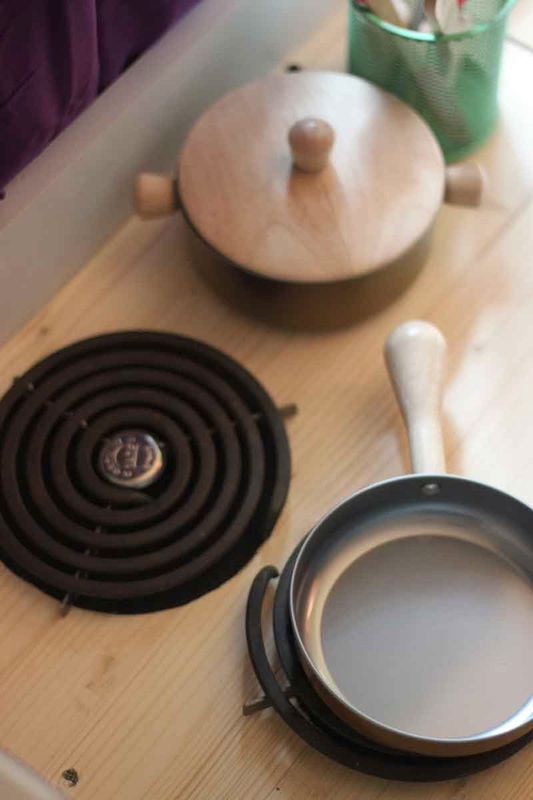 We found plastic cutting boards, baking pans, and the pot holders at the dollar store. A pen cup from Target holds all her utensils. We already had a colorful plastic dinnerware set that Ella has been playing with (I think it also came from Target) but I did pick up a few more plastic bowls at Target. I collected a few recyclables (an empty oatmeal container, a washed and dried half and half pint) to fill her fridge. In the future, we'll add some play food and maybe a sink. I'd also love to paint or cover the shelves, but we are all loving playing in her play kitchen! I haven't eaten this many pretend cookies and this much imaginary chocolate pudding ever. 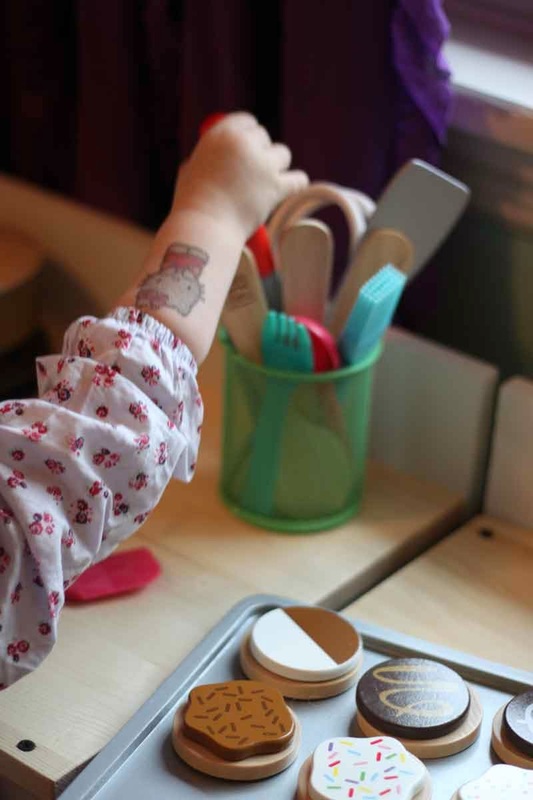 I'm keeping a pin board of play kitchens and play food going - feel free to follow along. 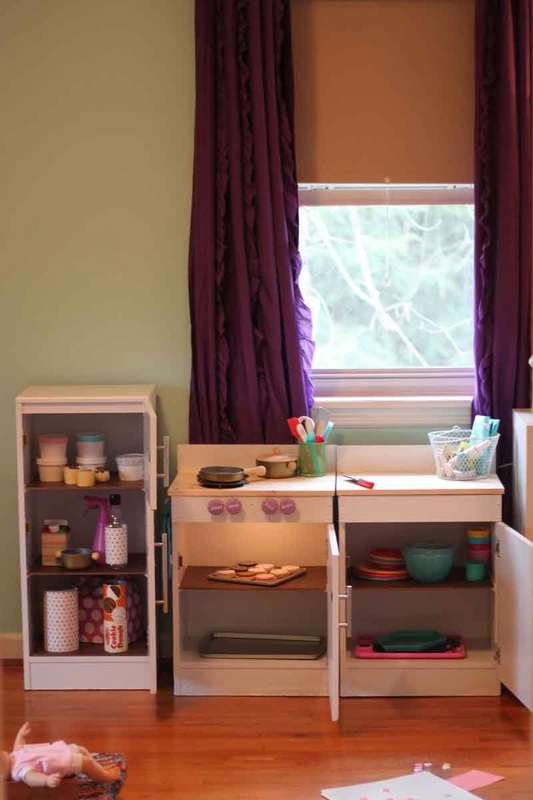 Do your littles have a play kitchen? Did you buy or DIY? How do you deal with your kiddos growing up? What a fun project! It turned out so stinkin' cute! Ella is so lucky to have such crafty parents! Ha! Ella is lucky to have crazy parents, or more like a crazy mom who twisted her addy's arm into doing stuff! This looks amazing! 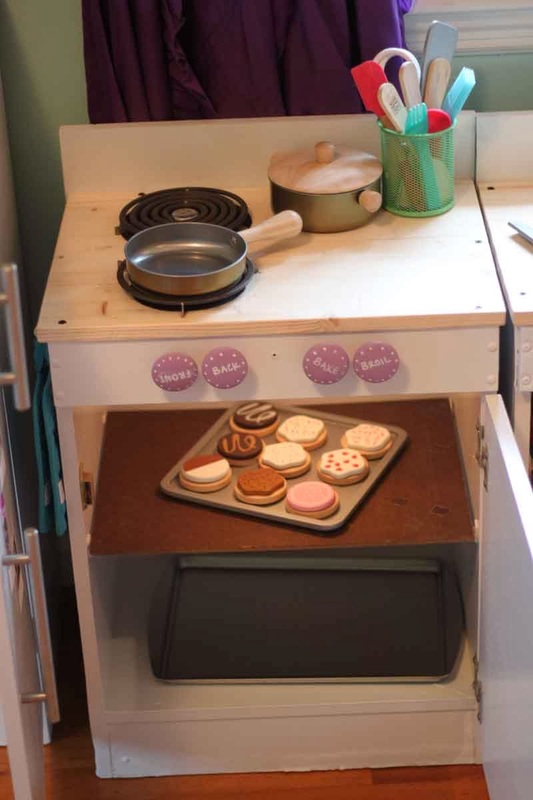 I love all the small touches - the pot holder hook, the light in the oven, the hand-painted knobs. Ella is one lucky lady. Thanks Patty - we had fun doing it! Wow.. I adore this.. So creative and I love all the little additions like the painted knobs and items for her fridge.. Thanks Erika! It was a really fun project! This is beautifully done. My daughter will be thrilled to have this in her room. I'll ask hubby to make this. Queen Bedroom Sets This is exactly the information I'm looking for, I couldn't have asked for a simpler read with great tips like this... Thanks! Wandering for RTA kitchen cabinets to give a new look to your kitchen? 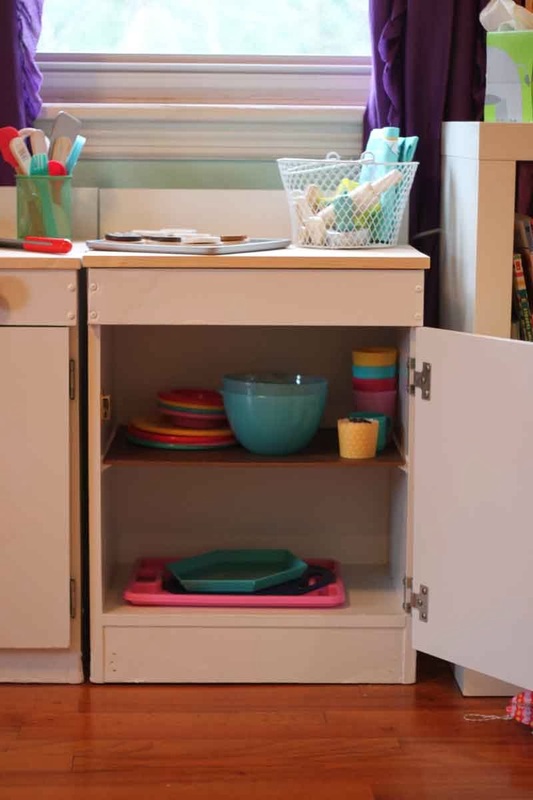 Browse the Cabinet App- Kitchen products online and find a large variety of RTA kitchen cabinets, drawer boxes, organizers, vanities, and doors etc. Register now for shopping your required RTA kitchen products!